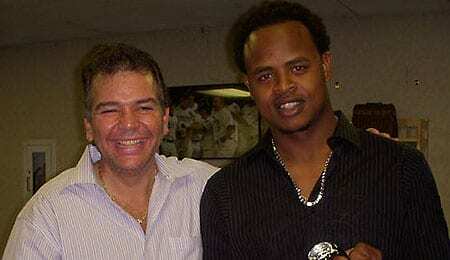 Edison Volquez, right, earned himself a lot of fans in 2008, but his chances for a repeat seem slim at best. The 2009 RotoRob MLB Draft Kit continues as we release more of the Top 10 Lists Fantasy Owners Always Wanted But Were Afraid to Ask For. Today, Alex has his choices for 2009 flops. They were huge in 2008, but these are the players who won’t come close to repeating their performances of last season. 1. Edison Volquez, SP, Cincinnati Reds – There is no way in hell that Volquez repeats his 2008 season in which he won 17 games, had a 3.21 ERA and a 1.33 WHIP. He pitched nearly 200 innings and went over 110 pitches over a dozen times. Dusty Baker wore him out last year and now he will likely suffer the fate of so many before him. I think an ERA around 4.00 with 12 to 15 wins is more likely this go around. Then again, an injury to his overworked arm is possible and if that happens, Volquez could put up something much, much lower. 2. Joe Saunders, SP, Los Angeles Angels of Anaheim in California near the Pacific – Bazooka Joe posted 17 wins and a 3.41 ERA in 2008 despite getting hit all year. He does not get many strikeouts and hitters are always putting the ball in play. I will be surprised if his ERA is lower than 4.50, as the baseball gods create balance in the universe. I would avoid him this year because you will be overpaying for an average pitcher. Sorry Joe, it’s a No-Go! 3. Chipper Jones, 3B, Atlanta Braves – I know a lot of Braves fans will get all fussy for me putty Larry Jones on this list, but is there any way he can replicate last year? No, he can’t. Jones ended up posting a batting average of .364 after he was chasing .400 for a couple of months. Sure, he probably will bat over .300 and still hit 20 home runs, but he will not be nearly the effective fantasy contributor as he was last year. Besides, have you noticed how chunky he’s looking at the WBC? 4. Cliff Lee, SP, Cleveland Indians – This southpaw had an amazing season last year, and while he could be good again in 2009, I do not see him approaching those kind of numbers. In 2008, he posted 22 wins to go with his 2.54 ERA. That is absurd for an Indian pitcher last year! I think a 3.50 ERA to go with 14 to 18 wins is more likely this year, so do not overpay for him. I only see a small chance at him coming close to last year and becoming a consistent fantasy pitcher. I do think he is much better than Volquez and Saunders, but all three of them will fall back to the pack. 5. Ryan Dempster, SP, Chicago Cubs – I think we are seeing a theme with pitchers, but it is true, we see this every season. There are a handful of pitchers that fall flat on their face or jump back to reality after a superb season. Dempster, after leaving the bullpen for a starting gig, posted 17 wins and a 2.96 ERA to go with a decent 1.21 WHIP. Here we have another candidate to drop in every category, but I think his drop will be less severe than the previously mentioned pitchers. The Cub offense can score runs and I still think a line resembling 15 wins, a 3.50 ERA and a 1.25 WHIP is reasonable for Dempster. 6. Ryan Ludwick, OF, St. Louis Cardinals – At 29 years old, Ludwick finally had a breakout year, slugging 37 home runs and driving in 113 runs to go with a stellar .299 batting average. If you take Ludwick this year, remember you will be overpaying for a commodity that has not proven himself on a consistent basis. One good year does not ensure results for the next season. I would expect Ludwick’s home run total to drop back to the high 20s and he may not even reach 100 RBI. I would avoid him this year, as his stock is too high. 7. Armando Galarraga, SP, Detroit Tigers – Armando had a great rookie season last year, racking up 12 wins with a 3.73 ERA and a nice 1.13 WHIP. For me, he does not really pass the eye test. Galarraga just does not look as good as his numbers last year. He gives up a lot of long fly balls and his strike out rate is below average. I think Galarraga’s ERA balloons into the high 4.00-range this year and he falls into fantasy irrelevancy. 8. Brad Hawpe, OF, Colorado Rockies – Hawpe has been a favourite of mine the last few years as I have used him multiple times to fill in for injuries and such. With that said, I think the loss of Matt Holliday tremendously diminishes the potential of everyone else left in Colorado to produce. I think the protection Holliday provided to Hawpe gave Hawpe the chance to hit with runners on and in favourable situations. With Holliday hitting dingers in Oakland, Hawpe will feel naked in the Colorado cold. He will have plenty of opportunities to “vent” to his teammates. 9. Jayson Werth, OF, Philadelphia Phillies – Last season, Werth had 24 home runs, 67 RBI and 20 steals, making him a well rounded fantasy presence. This year, even with the chance to start full-time, I think he will take a step back. He constantly has nagging injuries which I think will contribute to him sliding back to the pack. Werth could be a low risk, high reward type of guy, but I think I would avoid him this year. I would expect at least five fewer home runs and steals from the Phillie outfielder this season. 10. Brandon Phillips, 2B, Cincinnati Reds: A pretty sweet BA with 30-30 potential, right? Uh, not so fast. Did you notice that Phillips struggled to a .225 second half with just six homers and four steals? I’d tread cautiously here.